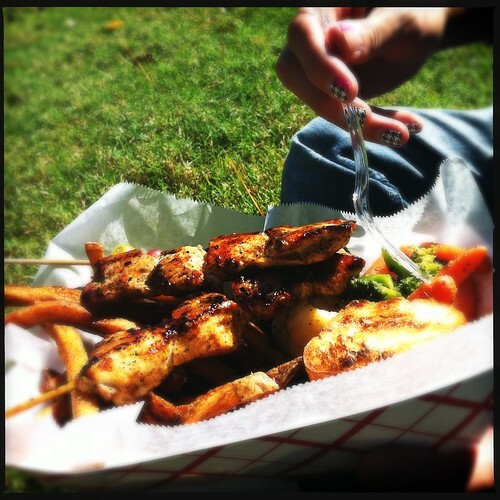 If foods served on sticks are universally beloved, it would only make sense that Memphis' newest food truck, Stickem, should instantly earn a place in our hearts. The Stickem truck's menu is simple: they serve food, mostly meat, impaled on sticks. I'm glad that they decided to pick a niche and stick with it. Too many food trucks try to be rolling versions of full restaurants, and by limiting themselves, Stickem is able to focus and make great food in a small space. Plus, the food-on-a-stick format works well in an environment where people might be walking and eating or not be able to sit down. When I found the truck parked at the Ridgeway Loop today, they were serving steak, chicken, tofu and shrip in kabobs or on salads. I ordered the steak kabobs and my friend E. ordered the chicken, both of which came with fries, vegetables and a little spear of grapes. It only took about five minutes for the two guys in the truck to make our food, and since there weren't any benches (and we didn't have an office to go back to), we plopped down in the grass and had an office park picnic. I expected the food to be good, but in a food-on-a-stick-from-a-truck kind of way, like a ProntoPup or something. Instead, I was kind of shocked by how incredibly good it was. My steak was cooked perfectly – it was juicy, just a little bit crunchy on the edges, and seasoned with a combination of spices that I'd buy by the jug if they sold it in stores. I don't normally like grilled chicken (it's one of those foods that seems to thrive on dryness and mediocrity), but Stickem's was tender and every bit as flavorful as the steak. As for the sides, the vegetables were pretty good, but the fries were great. They were some of the spiciest spicy fries I've ever had, and I wished I had remembered to buy a drink. 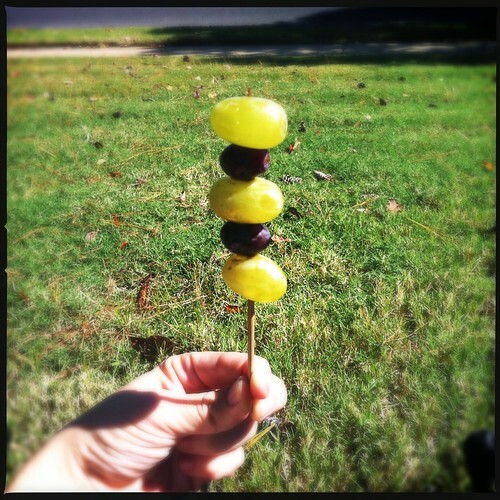 Seriously, though, food on a stick is happiness. Stickem is happiness. Stickem posts their location to Facebook and Twitter, and they seem to be out just about every day. I went to this food truck at the Food Truck Rodeo in Shelby Farms on Labor Day Weekend and it was awful so glad to see it has stepped up its game! Our food took almost 20 minutes and there were not that many people standing around let alone ordering/in line, I witnessed a woman get the wrong food 3 times and she finally just gave them money but told them to keep the food she didn't want it, also the young men who were taking the orders were not very friendly and hardly knew anything at all about what they served, last but not least by your pictures it looks as if they have changed the way they serve their meals because my food did not look like yours.. it was meat on a stick but in a sandwich it was the weirdest concept I have ever seen.